God's sovereign hand and good purpose in suffering, autism, adoption, crisis pregnancy, as well as gratefully sharing the testimony of God's redeeming grace in her own life. As many of you know 2018 has begun with quite a number of trials for the Sealy family - trials that all fall under the all-wise and ever-good hand of our faithful God. Phillip, my dear husband, was diagnosed with an invasive melanoma on his chest and had surgery as the year began - a 6 inch long and 3 inch deep incision. (He looks like he's been in a swashbuckling sword fight with Captain Jack Sparrow!) Thankfully his lymph nodes are clear - for which there is much rejoicing. Elizabeth, my 13 year old daughter, had an MRI for a knee issue she's been battling (possibly stemming from a bad femur break when she was 6). She is headed for surgery - actually two surgeries - to try and correct the issue in order to not lose long term mobility. We are tracking down a second opinion because of some soft tissue concerns the doctor has. Once that is figured out we'll get the procedure scheduled, but she will have about a 6 month recovery time. My father died on January 16th. I have spent the last year overseeing his medical care and trying to see some real restoration occur in our relationship. At the end of the day, I simply rest in the righteous and sovereign plan of my good and holy God. His ways have not been my own where my dad was concerned ... yet I will praise Him! While caring for dad over the course of this past year - particularly being in his room for an extended period as he died and then cleaning things up afterwards - I was exposed to some pretty nasty black mold. That mold has caused me to develop Hypersensitivity Pneumonitis (HP) and Asthma. After some respiratory tests we discovered that my breathing percentages are between 20-40 points below normal on many functions and that my expiratory flow is around 40% in its natural state, increasing to around 70% when O2 and an inhaler were added to the mix. That increase is good news ... but it's still lower than it needs to be and it doesn't last long. I am just weak as water right now. The doctor has prescribed a daily inhaler and has some more tests on the way. He has also told me to stay clear of my parent's house and any objects that have come out of it for now. (There is no cure for HP, therefore avoidance of the irritant is crucial.) That makes settling an estate a little tricky, but we'll get that figured out. Interestingly, the number one event this year was the weekend women's conference on "Suffering, Sovereignty, and the Joy That Comes From Jesus." I have learned much over the past few months as I've prepared for those conferences ... just as I've learned much from my interaction with the wonderful women who have attended the conferences prior to this needed respite. The past month, along with the next few months, afford me the opportunity to practice what I proclaim. And this I do proclaim: God remains good even in times that are bad. He remains holy when we hurt. He is still gracious though we groan. He continues to be in control even when our circumstances seem to be out of control. And He is worthy of our praise even when there is pain. Thank you for the support so many of you have shown as public opportunities to hold forth the hope that lies within me have exponentially increased over the last few years. What a precious privilege! Lord willing, I'll see you again somewhere along the road after some recovery time. Topic: "Learning to Lament: Groaning Without Grumbling"
Topic: "Suffering, Sovereignty, & the Joy That Comes From Jesus." Topic: "From Wrecked to Redeemed: Connecting Those Who Suffer to the Savior"
Topic: "Suffering, Sovereignty, and the Joy That Comes From Jesus." Topic: "When Jesus Makes Us Wait: What Do I Do When Stuck on Stormy Seas?" Topic: "Six Scarlet Scenes - One Sufficient Savior"
Additional speakers: Emily Colson, Mike Beates, & Barb Newman. Jay & Katherine Wolf (www.hopeheals.com) will also be speaking. Susan Hunt will be speaking. Kathleen Nielson (www.kathleennielson.com) will be speaking. John Stonestreet (www.colsoncenter.org) and Emily Colson (www.emilycolson.com) will also be speaking. Emily Colson (www.emilycolson.com) and Stephanie Hubach (www.stephaniehubach.com) will be speaking. performing "Surely" & "Remember, O Thou Man"
share her gifts and graces to lead others in worshipping our Savior." - Susan Hunt, author of "Spiritual Mothering"
"Lori's music and testimony lead others to know better the sovereign power and immeasurable grace of God. Her concerts blend a clear presentation of God's truth in word and song with a genuine transparency of how that truth transforms her life daily. I have learned much from her in understanding the challenges of life with autism, as well as in knowing how to glorify God in the midst of inadequacy and weakness. Her doctrine is sound and her manner resolute, yet gentle. All who hear her will be blessed." "Lori is so gifted on so many levels, that it is challenging to know which ones to highlight! She does a masterful job at choosing music that weaves seamlessly into the themes of an event; leads worship with a passion that always points to Jesus; and performs beautifully with a powerful and simultaneously sensitive focus on the power of the gospel. She is as equally gifted as a speaker. Lori is an absolute gem, but never the focus: that is always Christ alone." "Lori's life and story display the greatness of God like few do. Her performance reflects a deep journey of faith and an obvious passion for her Savior. She is an extremely gifted musician, and her speaking style is relatable and engaging. Lori's testimony speaks to the brokenness of life with rich and encouraging truth, and her ministry is having a profound impact in the lives of many." "Lori sings out of the overflow of a heart that walks closely with Jesus. Her honest and genuine style endears her to all." family and friends fall in love with Jesus, invite them to a concert with Lori." 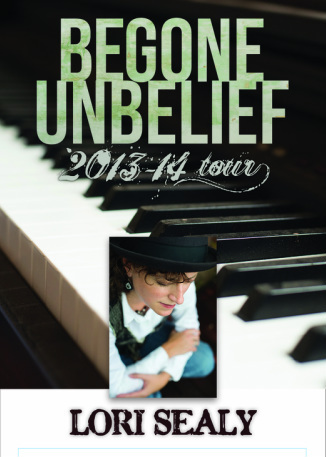 "Lori Sealy is a tremendously gifted musician. But more importantly, she is a woman of tremendous faith. Her grasp of doctrinal issues like grace, forgiveness, suffering, mercy, and God's sovereignty enrich her ability to minister through music. Lori has a passionate heart for her Savior and that passion is captured in her musical style, as well as in her performance. Her personal testimony of God's electing grace - from human adoption to heavenly adoption is a powerful display of God's pleasure to redeem lost sinners. You will not be disappointed to be led to the throne of God in psalms, hymns, and spiritual songs with Lori Sealy." "Lori's passion for our Savior is evident in every aspect of an event. Whether she's on "stage, at the dinner table, talking with retreat goers, or setting up sound equipment you will see Jesus. She has a remarkably engaging way with words and is able to describe old truths with respectful and relative freshness. God has given her a seemingly intuitive understanding for drawing genuine worship out of an audience rather than mere singing from a crowd. You'll walk away having been drawn to the throne of grace. I can't recommend her highly enough." 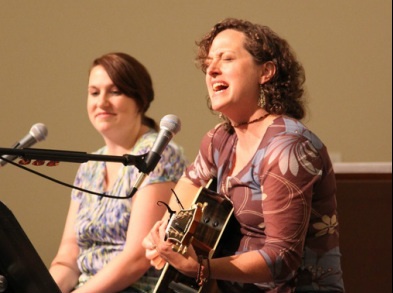 "We've been blessed to have Lori lead the singing at our women's retreats for several years and we hope she'll continue to keep coming back. Our ladies can't get enough. We repeatedly receive extremely positive feedback from our group of 100 or so ladies. They ask to have her return each year and want to do even more singing at each year's retreat! Lori does an excellent job of leading the group in worshipful singing. She brings such vitality to our group as she leads classic hymns of our faith and she blesses us when she shares some of the songs she has personally written. 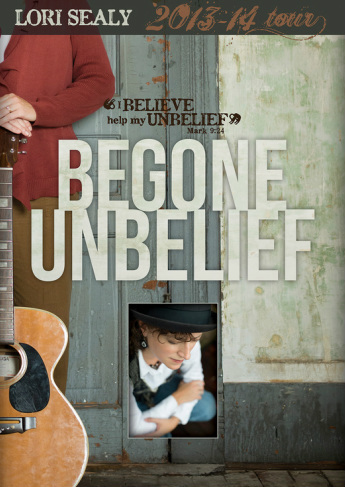 Lori is truly gifted in bringing the Scriptures to life through her music." with the promises and grace of the Heavenly Father."